Holly's Horrorland: Want to see Betty White go on a Killing Spree?! 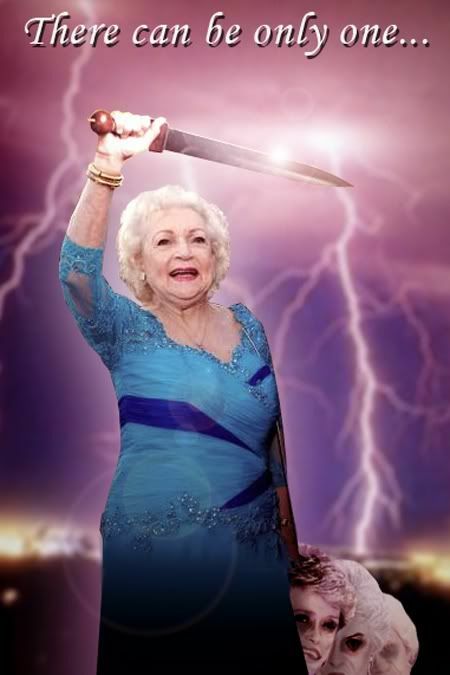 Want to see Betty White go on a Killing Spree?! Okay, not Betty, but another awesome old lady? and she hopes to hack her way into your hearts! Cybill's sad story turned gory starts at her 80th birthday party. She discovers that her kids have secretly arranged to put her in a nursing home. Not only that, her estranged drunk of a son also plans to steal her vintage car. Needless to say, mama is mad and decides to make them pay... permanently! Want to see Killer Granny on the big screen? Then kindly make a monetary donation here. You'll receive some sweet stuff for doing so! Maybe I'll donate something, if I ever recover from the disappointment caused by your false promise of Betty White going on a killing spree. Damn you! Aaron - Sorry, had to get your attention somehow. Please accept this badass pic of Betty as an apology. Real Queen of Horror - Totally!